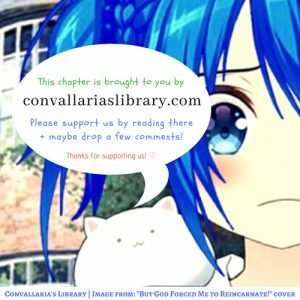 Happy reading and please do comment after you’re done reading! On that day, Belvant, who returned home from his work, noticed that his beloved wife who jumped out while saying, “Welcome home,” had a strangely expectant face. Marietta clung to him with her thin arms, her whole body expressing her love just like a faithful dog that wagged its tail. Marietta, who had married the world’s dreamiest man that possessed wonderful muscles on top of being fearlessly handsome, the one who was stronger and manlier than anyone else, the one who knew everything and could be depended upon (though it was only from Marietta’s point of view) and lived her days full of happiness, couldn’t endure waiting so long for her husband’s return every day, because it was obvious that she couldn’t see him during his work. Even if his chest was tight due to the affection he felt for his wife whose adorableness stood above all–the wife who loved him unconditionally, Belvant was still the renowned General of the country who had been through countless battlefields. Therefore, he responded while demonstrating an adult’s composure. After showing a smile that was only for his wife, Belvant gently returned his wife’s embrace. The new wife that couldn’t help but love, love her husband so much, gazed at Belvant as her blue eyes were glittering just like limpid water. When that frightening face–that was said to be a demon or a beast during his work–showed a gentle smile, he transformed into a beautiful man who doted on his wife. Belvant didn’t wait for an answer before he proceeded to kiss her. Even when Marietta thought, ‘That’s not it, but…,’ she didn’t want to miss an opportunity to be lovey dovey, so she brazenly accepted his kiss. She then smiled while rubbing her soft cheeks to her beloved husband’s overly sturdy chest. Marietta, who still hadn’t realized how much danger her statement would cause her, clung her white arms and glued her body to her husband, behaving like a spoiled child. As for Belvant, he wanted to carry her just like this and brought her straight to the bedroom, but he then remembered the words that Sierra habitually said, so he finally gave up the idea. General Belvant Fargus, who wanted to lead an everlasting and healthy life with his beloved wife, knew that he could avoid the risk of breaking his wife as a consequence of his overwhelming love by following the advice given by Marietta’s faithful maid. Belvant noticed that a good smell wafted from within his arms, so he pressed his nose to Marietta’s hair, burying his face on the nape of her neck, taking the opportunity to lick the area behind her ear. Having her sensitive place suddenly licked, Marietta blushed as she raised a strange cry. Belvant put on a serious look and said such a thing as if it were true. Marietta easily believed his words because she had the past experience of being turned into a kitten by magic. Marietta whose ear was bitten by Belvant ended up involuntarily bending her body backward. In her effort to rescue the precious princess from the route to the bedroom, the cool beauty—whose lustrous platinum blonde hair arranged up—stopped Belvant from acting rashly with an overwhelming presence. Towards Marietta’s words, Belvant raised his face who looked a little bit regretful. As his fingers caressed the lingering dripping on the swelling bulges he just licked, Belvant stared at Marietta with a thrilled face and said. Marietta pulled Belvant’s hand, leading him to the table that was already prepared for them to have some tea. As he took a seat, there was one piece of something that looked like a small cake placed on top of a plate. It seemed that the adorable Marietta’s pastry making skill was quite catastrophic. As Belvant patted her blonde-haired head with his large hand that was used to holding swords, Marietta breathed out in satisfaction. He grabbed the fragrantly baked cake that looked delicious, biting it to try its taste. Apparently, the cake that had plenty of sugar in it also contained syrup to make it softer. The cooks couldn’t stop Marietta who thought that the sweeter it was, the more fatigue would be healed. However, in front of his wife who stared at him with such a serious expression and with both of her hands clutched as if waiting for him to say how it tasted, Belvant couldn’t bring himself to say that it was a little bit too sweet. Marietta’s face shone so brightly upon hearing Belvant’s words as he manly said it while enduring the sweetness. Let’s not touch on the subject of how it tasted like. Still, dear Marietta, did you not notice how sweet it was when you tasted it? Still holding the cake with his right hand, Belvant tapped his own lap with his other hand. After tilting her head for a while, Marietta obediently climbed to his lap. After Marietta blushed and opened her small mouth, Belvant put a bit of the cake into her mouth. Her round eyes turned even rounder. Did she finally notice it? Belvant tossed the rest of the cake into his mouth and ate it. Belvant devoured Marietta’s leeps greedily and thoroughly as he carried her sideways on his lap. Belvant stood up while still holding Marietta who was looking at him with her melting eyes, as he then gave instructions to the servants. It seemed that he had no plan on leaving the bedroom tonight as well. Such thing happened every now and then, though. BLURHH too much fluff…. I cannot handle it……….